The beauty and convenience of PuraVida will actually enable your customers to start enjoying their kitchen chores. Whether they opt for the electronic or the single lever kitchen mixer: the mixer body and control unit can be positioned separately. This makes provision for personal habits and ergonomic requirements. This means that physical requirements – such as being right or left-handed or having limited mobility – can also be taken into consideration during planning. Win them over with the many outstanding aesthetic and technical features. 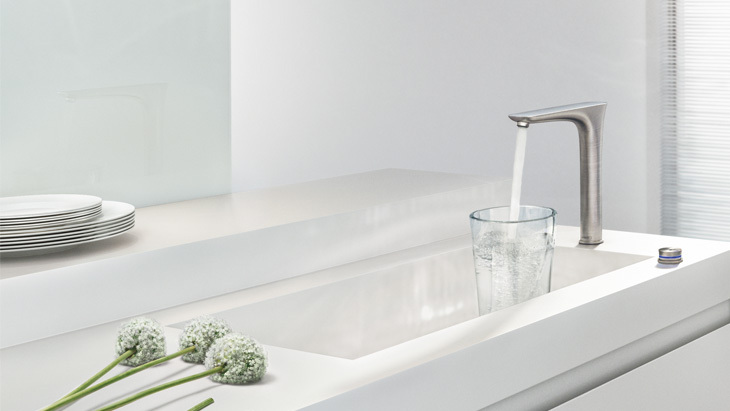 Emotive design with clear, soft lines – to make working at the sink a more sensual experience. With their exceptional finish, PuraVida mixers are sure to be eye-catching in the kitchen. Outstanding quality and precise workmanship down to the finest detail. Ultimate ease of use due to customised positioning of the handle and control unit – this innovative aesthetic feature is award-winning. More space thanks to the ComfortZone. The extra-high swivel spout (120°) provides more space between the spout and the sink and is ideal for filling up large pots and bowls. Whether you select a manual or electronic variant: the high, swivelling 2-hole kitchen mixers from Hansgrohe's PuraVida range are truly impressive with their emotive design, powerful functionality and customised ComfortZone. PuraVida kitchen mixers display a timelessly beautiful, purist design concept that entices you to touch and experience it. They are available in a stainless steel look and chrome – tailored to the common types of sinks, stoves or handle elements. The stainless steel finish, created using the PVD method, makes the mixer resilient to the demands of everyday use. The DualFinish in stainless steel look is particularly striking. The top quality is accentuated by the seamless material transition from brushed base set to polished spout. The 2-hole electronic mixer's control unit can be placed on, behind or next to the sink: independently of the spout. Its outstanding feature is the quick temperature selection. Your customers can select the predefined temperatures at the touch of a button: press once = cold water, press twice = mixed water, press three times = hot water. Users can steplessly adjust the temperature by rotating. 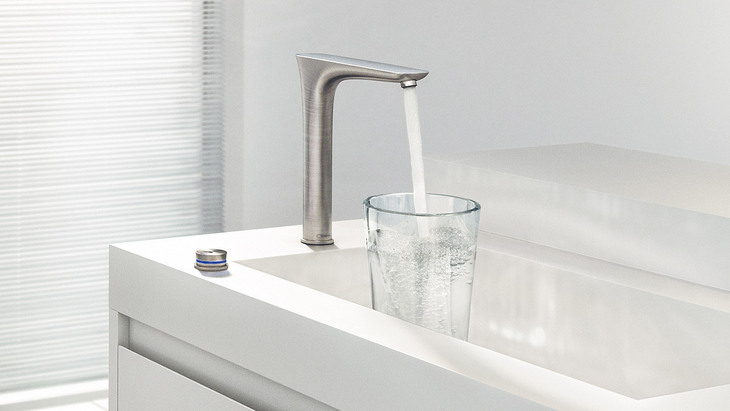 They can adjust the water volume by simultaneously pressing and rotating. An LED light ring uses colours to indicate cold and hot water. Your customers can store their own personal user settings. Tips & tricks for installing & maintaining Hansgrohe products on YouTube!